“Offerings” Coil Bracelet. $325. SOLD. Sometimes, we have little in the way of material goods, but that does not mean that we have nothing to give, either to others or to Spirit. In our way, it is customary to make an offering to the spirits at prayer: a little cedar or sage smoke, a little sweetgrass, a little tobacco, sacred items offered as we send our prayers spiraling skyward on tendrils of smoke propelled by an eagle feather. Wings honors this tradition with a coil made up of water and sky and smoke and the golden light of dawn. At the center, fourteen perfectly round lapis lazuli beads in shades of violet blue and cobalt are bisected by four freeform amber beads that glow like the sun. 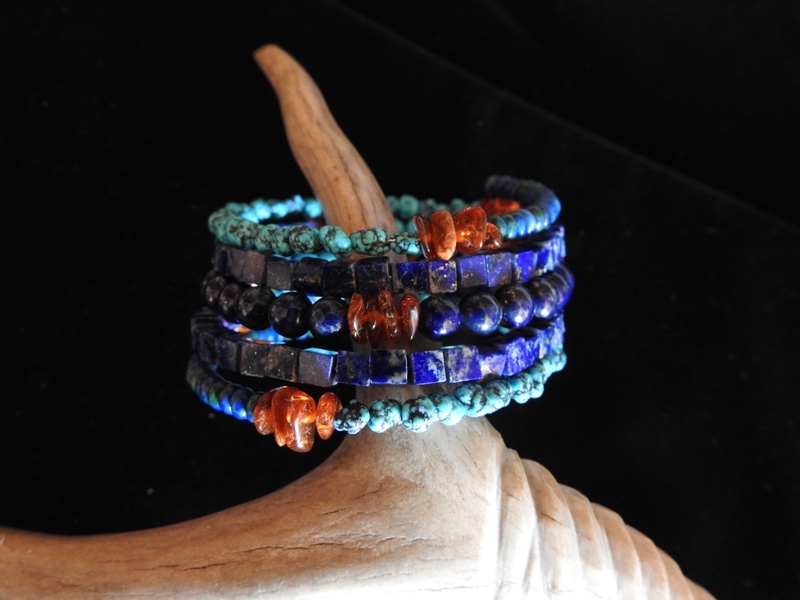 This central line is flanked at either end by short segments of brilliant sky blue Sleeping Beauty turquoise nuggets, themselves flanked by more amber beads. The coil flows toward either end in lengths of square smoky lapis lazuli beads, then sky blue spiderweb turquoise nuggets, and at last tiny rondels of azurite with malachite, all separated with short segments of sunny amber. Taken together, it produces the effect of a spiraling tendril of smoke and light offered to the early dawn sky. Beads are strung on memory wire, which expands and contracts to fit nearly and size wrist. Jointly designed by Wings and Aji. Posted on Thursday, December 22nd, 2016 at 4:40 am. Filed under: The Coiled Power Collections, The Generosity Collection, The Seventh Fire Series	RSS 2.0 feed.